Fine, exceptionally clear - crystal clear! 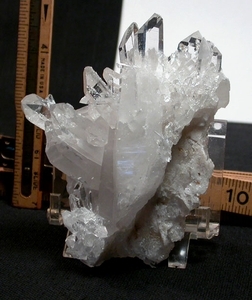 - points in a spray are accented with a lipped pocket of cryptocrystalline quartz, and a fully crystalized plate bottom. A long brilliant twin, penetrated with an uncommon needle crystal is 3/4x 4". Several bright smaller pairs of twins, too, and plentiful rainbows. Three faceless interspersed with Isis, channels and transmitters - and a good amount of glitter. Overall measurements: 1-1/2x 3-1/4x 4-1/4". From the long closed Clear Creek mine, Hogjaw area of Montgomery County.